Paytm New Year Free Rs.20 Paytm Cash Recharge Loot Trick Offer, Paytm FREE20 Free Recharge Coupon Code, Paytm Free DTH Recharge Trick Loot, Paytm App New Paytm Cash Recharge Coupons Loot Trick, New Free Rs.20 Recharge Coupon – Get Rs.20 Mobile Recharge Absolutely Free on Just Sign up + Also For Old User Using Trick. Hello friends, today once again i am here with another super loot after the big Amazon Gift card loot here is free mobile or dth recharge for all users. After so many time Paytm is back with some big loot offer on Recharge. Now you will Get Free Rs.20 Mobile Recharge/DTH Recharge From Paytm For All Users. You will get Free Rs.20 Recharge Instantly on Sign up. Also if you are old user then you can also get free Rs.20 Recharge using trick. One of the best thing is that you can also get free Rs.20 DTH Recharge. This offer is valid on Mobile Recharge, DTH, Bill Payment. So if you have the more number then this one is the big loot. Just get unlimited Mobile Recharge from Paytm. 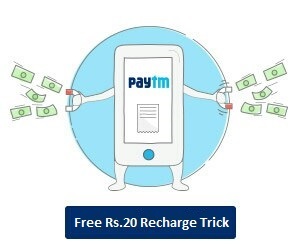 This is Paytm FREE20 Free Mobile Recharge trick also free DTH Recharge trick. So hurry up and grab one of the biggest loot offer of Paytm. NOTE : Old user trick will not work for all users. Click on Mobile Recharge/DTH/Bill Payment option. Enter details & amount Rs.20. Apply Promo code – FIRST20 to get free Rs.20 Recharge. Finally you will get free Rs.20 recharge absolutely free of cost. Enjoy the Paytm amazing Recharge loot offer. Now click on Sign up fro New account. Enter your Old Paytm Registered Mobile Number (Make sure the Paytm Balance is Rs.0). Don’t enter any Email Id. Enter any new password & click on Sign up. Now you will get a popup message. Just click on No, I didn’t. Finally now your new Paytm account created using your old Paytm account number. Apply Coupon code – FIRST20 to get free Rs.20 Recharge. Finally you will get Free Rs.20 recharge. Promocode can be used 1 time per new user. Valid on prepaid, postpaid, dth, datacard. Not valid for Airtel services. yes bro old offer hai abhi new code aya hai, naya number se paytm account bna ke try kr skte ho..
Use – FIRST20 to get instant discount. old number sing up nahi ho raha hay …..
FREE20 apply hone k bad bhi card nmbr mang ra to chor de,FREE8 add money coupon se Rs.8 Paytm csh mil raha hai yeh try kr lo. old num pai offer kaam ni ker ra h.
Try in new number (Fresh/Unregistered Number).